This is absolutely beautiful! Thanks for all ideas to decorate with one Tablerunner. Thanks for the chance to win. I love your table runner and how you used it all through your house, which is beautiful. 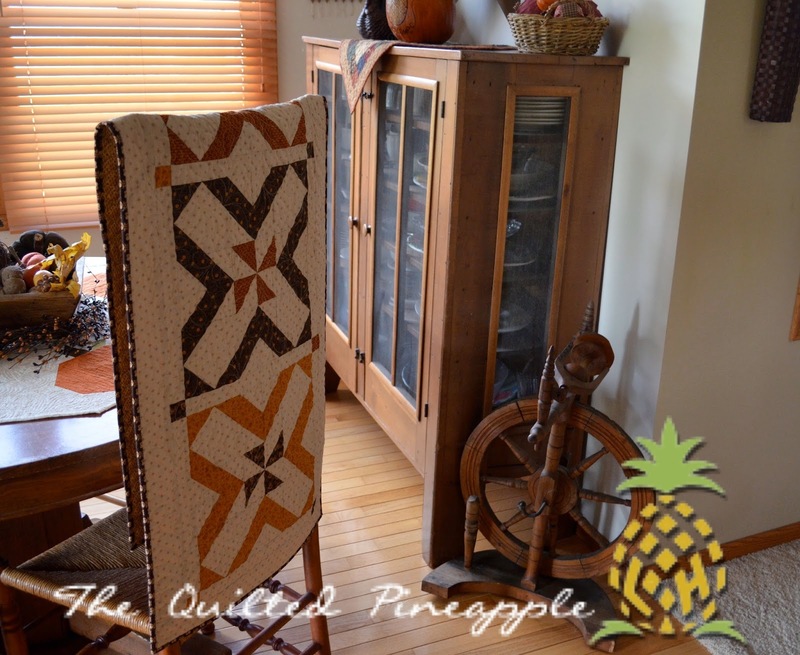 Quilted Living is a great title! I like the design of this runner and all the ways you decorated with it. Absolutely, my pick of pattern......... my favorite. You did a fantastic job on the runner. Thank you for the opportunity to win s great book. 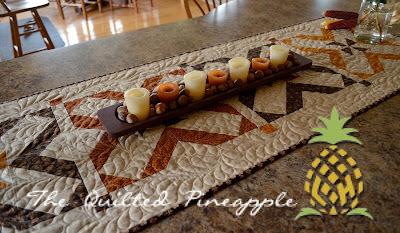 Love your table runner and how you displayed it throughout your beautiful home. This book is definitely on my 'must have' list!!! I love the runners I seen so far from this tour and waiting to see more. X-ceptional is soooo beautiful Linda...the table runner is absolutely perfect in every area of your home!! 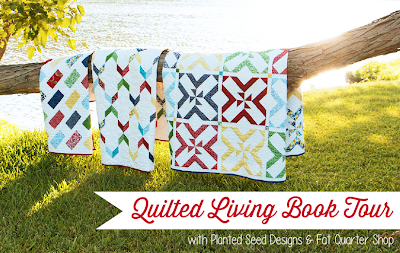 I just know Gerri's Quilted Living book is a must have book for every quilter's library. Thanks for the chance to play with her 'awesome' book!! Happy stitching!! i love this quilt design, so simple and so striking. Love your style and your new table runner. Thanks for the opportunity to win the book! Your home is lovely and this runner is a perfect fit. Loved seeing your ideas for displaying the quilts. Thanks! I would love to win the book!! I would also love to have your kitchen!!! The table runner you made from the book is beautiful!! I've always loved Gerri's designs in magazines-the book looks wonderful! As always, your quilting is beautiful too. I love what you have created, Linda! Switching the colors of the pinwheels is a great idea, and, of course, your beautiful feather work is the icing on the cake! It is a delightful sight everywhere you have displayed it, but especially hanging there at the bottom of the stairs. So pretty! Your table runner is beautiful. I love the feathers. I guess the hardest decision is where to place it. It looks so pretty in every spot. Lovely feathers and beautiful displays! Thanks for sharing your work - so inspiring. I love your runner. 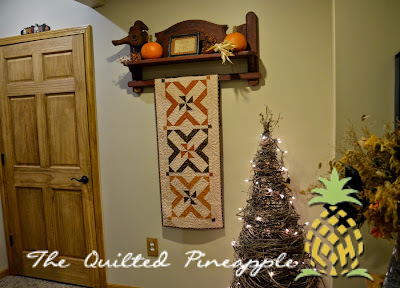 I also decorate with quilts...they're everywhere! Thanks for the chance to win a copy of this book. I love having quilts through the house - makes it cozy! Beautiful runner, beautiful home. Your quilting is stunning, as usual~! You did a wonderful job with that pattern. The book looks like there are more wonderful projects to make. Great giveaway. Nancy P.
I'm in the process of adding more quilts around my home. Your decorative touches in your home are beautiful. Thanks for the chance to win that awesome book. I love it when a room and quilting come together. Beautiful quilt, beautiful home. I never in a million years thought to put a runner on my fireplace. You gave us a lot of great ideas of how to decorate with our quilts. 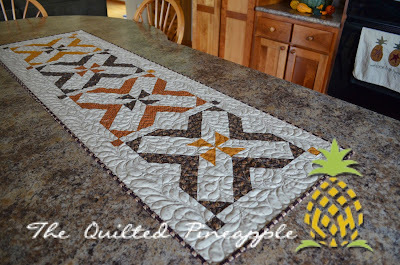 Beautiful runner and gorgeous quilting. It looks wonderful no matter where you place it. Thank you for the chance to win this awesome book. What a lovely, seasonal runner. I'm seeing more "need to make" quilts in the new book! 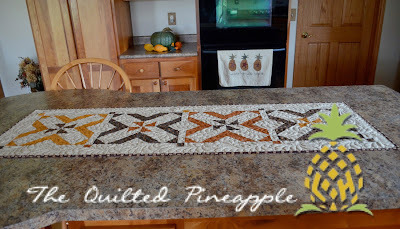 Great looking runner, and I love how you made it your own.Gerri's designs are lovely,and your quilting is gorgeous, it shines in your home, enjoy!! Love your choice of colors-- really perfect for fall! ... and so many great display ideas! just awesome! I don't normally decorate a lot for Thanksgiving but this year I'm inspired! Your table runner is just my style. 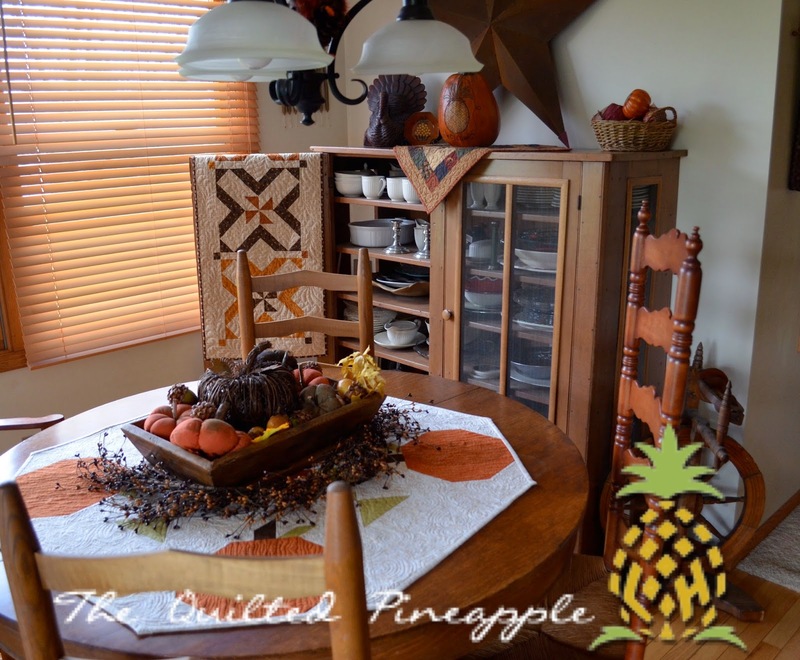 And I love the pumpkin table cloth on your table! Beautiful table runner. Love your color choices. Would love to win a copy of this book. Beautiful table runner. How have I missed seeing your blog before now?! Love it! HI,love your runner! Thanks for sharing a great book giveaway>love all of Geri's quilting too! It was interesting to see all the different ways you found to use your table runner. What a lovely home you have! Beautiful runner! I Love how you have displayed it several different ways. thanks for sharing in the hop and for the giveaway. I loved your choice of colors even though I wouldn't normally choose brown. Must be that popper of cheddar! I absolutely LOVE your table runner! I was just thinking about making one myself and you certainly have inspired me with your X-ceptional version! Hope I win as I'm sure there is plenty more inspiration in the book! Your use of the feather design is also "X"ceptional! I hope to win the drawing so I can create something special, too. Lovely project with gorgeous quilting. Thanks, I'd love the chance to win the book. Looks great! 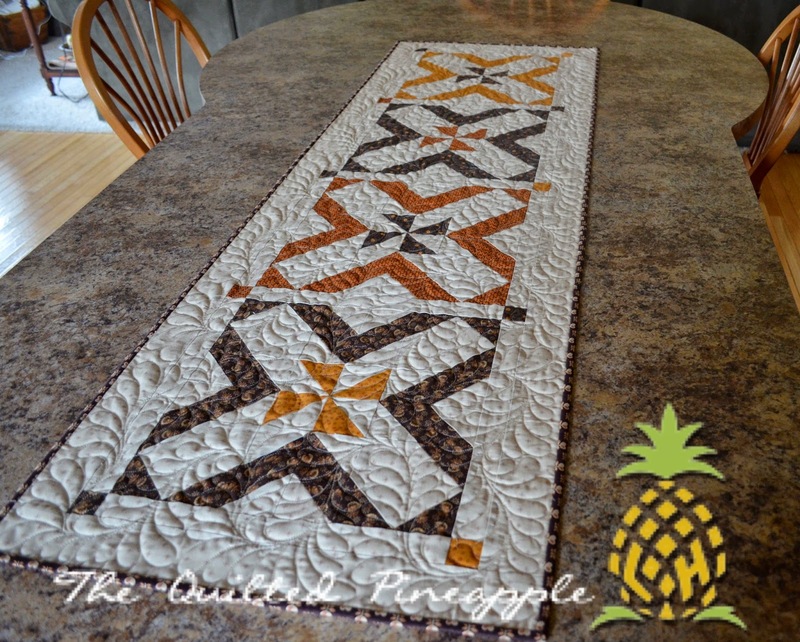 Your table runner is gorgeous! The quilts you make always look so nice. Love seeing X-ceptional made in repro fabrics and I am thinking it would look great in Christmas fabric, too. This books looks like a great one! Thanks for the mini-tour of your home, Linda. I've always wanted glass front cabinets in my kitchen. 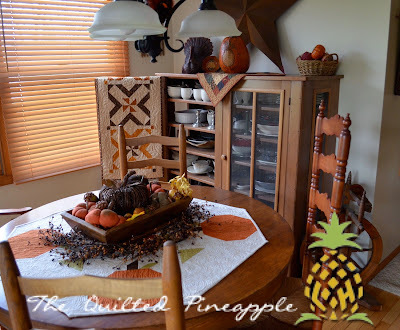 The table runner is a great project for the holidays and the colors you chose certainly look good for Thanksgiving. Thanks for the chance to win a book. Your runner is just beautiful! This looks like an awesome book. Thanks! I love the pattern and colors you chose. I love your take on this pattern! 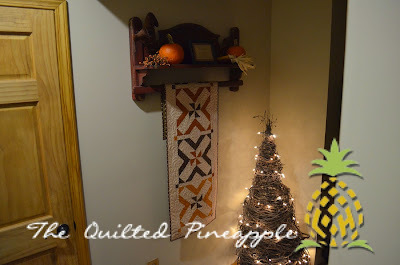 Your choice of fabrics, quilting and just ways to display projects has got me thinking! 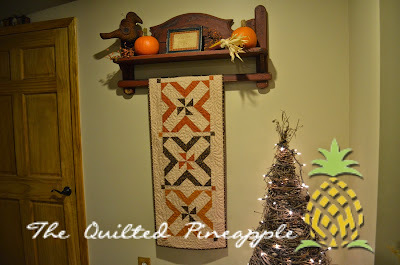 I'm not into table runners, but your display on a wall hanging is something I hadn't thought about ~ thank you! I would love to win a this book. Glad I found your blog, I'm now a follower! I love the colors in the runner and of course the quilting is beautiful as well! Love the different color way... Provides inspiration for those that are color challenged!! Love your version! Looks like another wonderful book. Thanks for showing us all the ways to show off this runner and make it part of your Living Quilted home. Love this pattern and your colorway. Your runner is gorgeous! Such warm and yummy colors! You have a beautiful home. Oh my, I love that table runner. Beautiful! Wonderful fabric, beautiful table runner! Thanks for the chance to win the book! I would LOVE to have a copy of this book and I LOVE the runner you made! It looks perfect!!! You are such an amazing quilter and so talented!!! Love her quilt designs! I don't think there is a design in the book that I don't like! It looks like a great book. Thanks for the chance to win. Your runner really is X-ceptional!! I love it! I love fall! Your colors are great. Great choice for your table runner! The colors are beautiful and your home is lovely. Thank you for joining in on the tour and for the chance to win! Love all your x-ceptional decorating ideas! Your table runner is one of the designs that I'd most like to sew from this book - beautiful! Thanks for the chance to win! What a beautiful interpretation of this pattern! Your color choices were spot on and I loved that you photographed it in a variety of settings. Love the colors you used in the tablerunner. I am still amazed how different a pattern can look just by the colors chosen by thee quilter. I would be very happy to win the book. I have not made table runners but yours looks lovely in your home. Thanks for the chance to win such a nice new book for inspiration. I'm with you Linda, you can never have too many quilts! They create a HOME. I love the displays you have in your home, cosy and welcoming. Love your color choices, it's so fun to decorate with quilts. They warm a home like nothing else! I love your tablerunner! Beautiful! I would definitely love to win a copy, thanks so much! You did a wonderful job in picking those colors out for the table runner. The table runner shows off your tabletop so nicely. Thank you for the chance to win a copy of the book. Love your runner! Thanks for the chance! Love Gerri's patterns and the clear instructions so I'm sure I would love this book. It's always nice to see the interpretations of others and your runner is no exception. 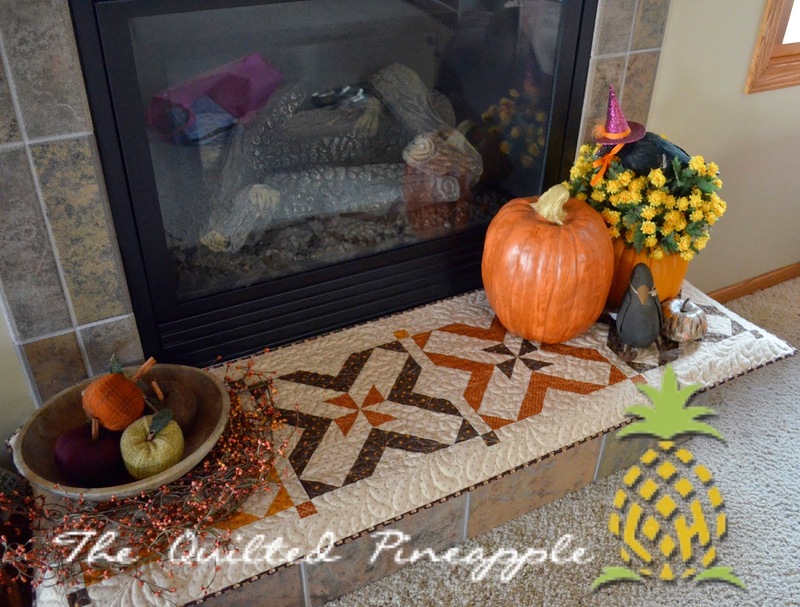 Beautifully quilted and the colours fit your home. Linda, your tablerunner is beautiful! Thank you for the chance to win a copy of the book! I love your table runner and your choice of colors. Beautiful tablerunner! I would love to win this book -thanks for the chance! Love the colors you used...fall is my favorite season, but would love this book to make the x-ceptional pattern for spring decoration. I absolutely love the quilting you did, you make a simple design stand out. I would love to own this book. Such a pretty fall table runner. It is my favorite season, so I love the colors you chose to use! Very nice table runner! I saw the Quilted Living quilts from Quilt Market posts. I fell in love with most of the quilts. Would love to add this book to my library! I like the colors that you have used in your runner. It is nice to see the many ways you are able to use the runner in your home. Would like to have a copy of this book! So intrigued by this book. I love the alternating color way. Thanks for the peak inside your home! Love the table runner you made and quilted with feathers is the perfect touch! Gerri's book looks wonderful, thanks for the chance to win it! I am in need of a new table runner and yours looks like just the design I want! Not so sure I could do the FMQ as well though. I will keep practicing! I am loving these table runners I am seeing this book seems to be pretty awesome too Put me in ! thanks! Hello Linda. I love the mixtureof...cheddar pinwheel with chocolate block and vice versa. It's so stunning and I can appreciate how it displays well in every setting in your home or mine (I love Autumn). Thank you so much for sharing your technique(s) and the opportunity to win the book by Gerri. Very Nice as usual.......Linda. The colors, the quilting (of course always is amazing) and the sharing of how you display. 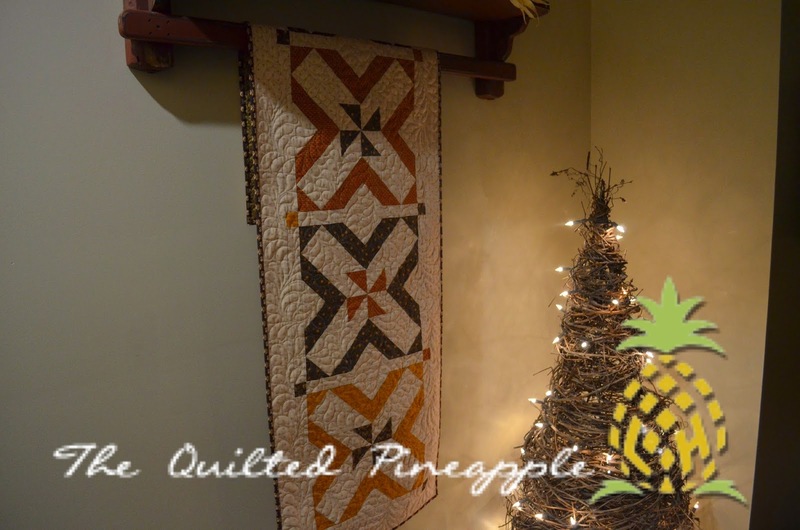 I created a new Pinterest board for quilt displays. Loved it all. Can't wait to get a copy via the blogs or via purchase. Looks amazing. Your runner would be a welcome & functional fall decoration!! Beautiful runner and I love the quilting that you did. Love your runner, and you're right- it looks awesome everywhere! Please count me in for the book giveaway! Thanks. I absolutely love your color choices! And that blick is awesome. I want this book so badly! Of course your quilting makes it! Yes. There need to be lots of places to hang quilts because we like to make so many! I would love Gerri's new book. All her fabrics, work, and patterns seem to be high quality. I recently ordered a quilt kit from her and I was very impressed. After seeing the samples, I would love to make some of the items. I love your runner. I don't know that I would have thought to make one from that design, but look how fabulous it is! I love this block. It made a beautiful runner. Exceptional quilting. Your table runner is gorgeous! Thanks for the inspiration and peek inside your home. I just signed up to follow your blog via bloglovin. Gorgeous table runner, and the book looks fabulous! The runner is wonderful. I wish I had that much energy to change with seasons. What a wonderful tablerunner. I would love to make the X-ceptional pattern from this book. I love your color choices on the runner. Can't wait to see the rest of the book tour. Lovely quilting as always! Thanks for the giveaway! Your table runner is gorgeous - thanks for the chance to win. Can you please come decorate MY house! WOW!! I am the queen of table runners-great way to try lots of quilt patterns before committing to a large quilt! Love yours.....off to visit the next stop on this hop! 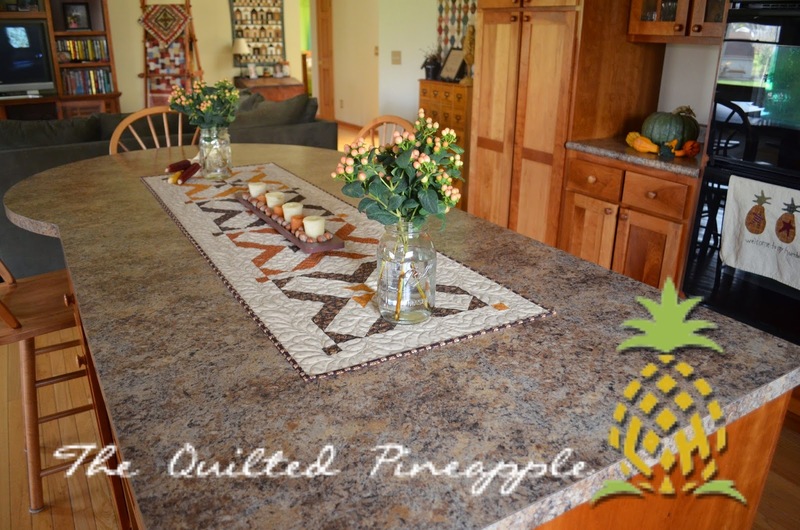 I love how you took the quilt pattern and adapted into a lovely table runner. Your colors are perfect for the fall season and I can only imagine this pattern in Christmas colours too. What an inspiration you are to other quilters. I must get this book as I see future projects that are calling to me. Love your runner! The use of those colours is ideal for the time of year and it is good to see the cheddar colour used in this combo. The quilt design really makes the whole look pop. Thanks for sharing. What a beautiful project! I love the feathered quilting! I would love to see the rest of your home and how you've used quilts to decorate. New to your site and I just love this pattern!!!! I love the colors that you chose for the runner and the quilting is beautiful as always. Your work is inspiring...We all need a little inspiration, I look froward to each and every post. Thanks for sharing your work and giving one of us a chance to win this wonderful quilting book! Wonderfull , i Like your job And your colours to make this block YOUR block..i don't speak very Well your language. But pictures are so easy to understand .. I wish to win this book And too make this block with my colours...to be mine in my home in France... Thank you . Absolutely love this runner and it looks great in so many ways. Thanks for the chance to win what looks like a very cool book. Love your table runner and the book looks awesome!!! So many great ways to use these toppers and love how use combined the colors.....thanks! I love all the ideas in this book. Very enjoyable. I really like the project you chose. I think this is the one that caught my eye first upon seeing the book cover. 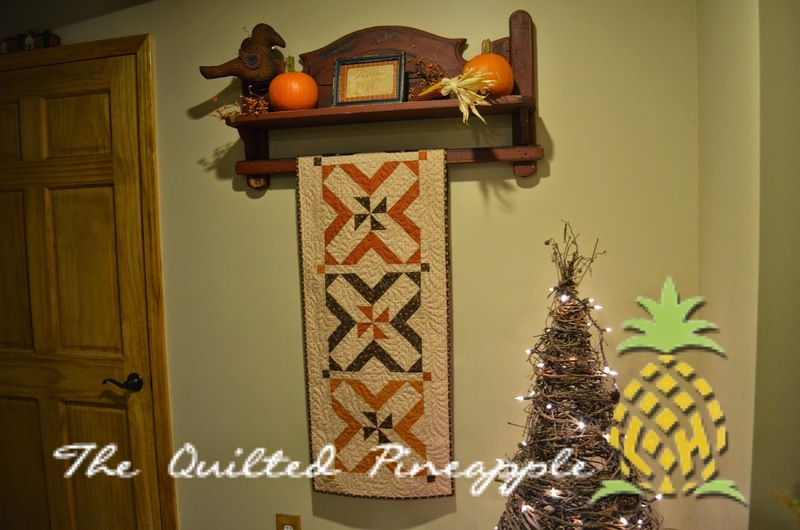 I love seeing all the pictures you've shown to give ideas in using this runner. Very nice and I love your towels in the kitchen. Perfect for you. Thank you for all the extra work you did in taking all those pictures so we all got such great ideas. Oh my goodness, Linda...that is just DARLING!! I was totally unaware of this book & this tour. I am so glad you participated so I could learn about it. I adore your pretty autumn runner & the various places you used to display it have really sparked my imagination. Thank you so very much for sharing your talents & for giving us the chance to win this wonderful book, too. If I should be so lucky to win, my email address is rett at neo dot rr dot com. Love the runner you made! Love the runner and how you used reproduction fabrics but it had a modern look. Would love to win and hope you and your family have a blessed Thanksgiving in your wonderfully decorated home. I love your table runner and your answers for "what are doing with that one?" 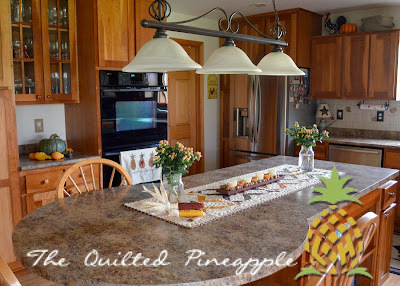 Always inspiring to meet new quilters through their blogs:)!!! The book looks really practical....thanks for the chance to win it! 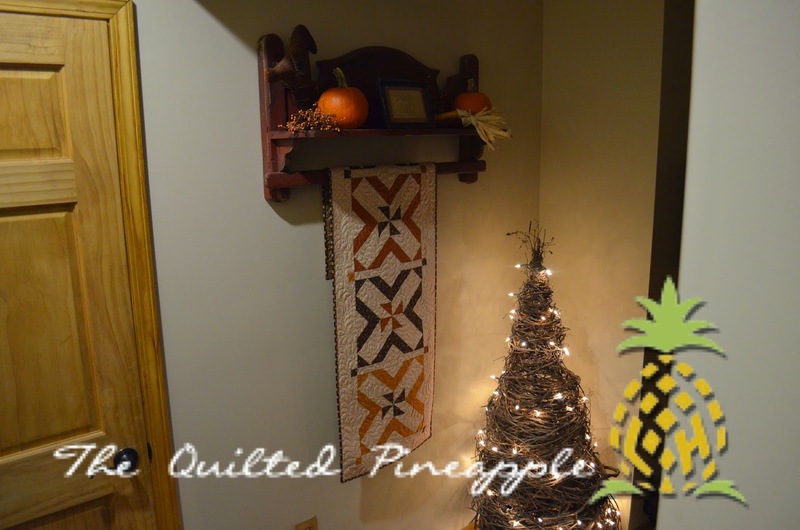 I would love to win aand I also love seasonal quilts to change things up at home. Looks like you had a lot of fun decorating, and re-decorating for this post! Thanks for all the great ideas! I can't seem to find first my post. Thank You for sharing how to use your tablerunner in different places, love your choice. 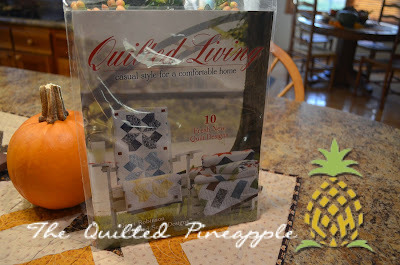 Love the book title "Quilted Living"
Love love love the runner and your quilting. I need that book. Love your table runner and all your decorating! Beautiful! I'd love to win. Thank you for the chance. Thanks for the chance to win this book. As always I'm inspired when I look at your quilting creativity. Good day for quilting today as it is a cold, blowy day up here in Canada! beautiful runner, Linda. Thanks so much for sharing and for an opportunity on a super book. Your projects are gorgeous! Thanks so much. I would love to make that runner for my island. Lots of great decorating ideas with one little project! I'm babbling for it :P!!!! Your quilt is truly X-ceptional!!!!! Absolutely beautiful table runner. And you are right it looks great no matter where you place it. Looks like a super fun project that I'd like to make. I love the way you personalized that pattern, making it a perfect addition to your home decor. wow this is so pretty. thank you for sharing. will have to put this book on my Christmas list for sure. This is a great project and would make lovely gifts. I would be thrilled to win this book! Linda, I just started following your blog because I read FQS blog post about the book! So excited for a chance to win and to see more of your posts! I love the table runner you made and the colors you chose to make it in. I was really drawn to the X ceptional quilt on the cover and so pleased to see it adapted to suit your purposes. I love your colours. It is heartwarming to see someone who hangs their table runners on chair backs on purpose. I cover our portable air conditioners with table runners as well. Much easier to get rid of the dust and way prettier. Since our warm season is very short, those air conditioners are the stage for many seasonal runners. Thanks for sharing and offering the giveaway. I love your examples of how to use the table runner in all settings. Thanks for the chance to win. This book looks awesome, I would love to win a copy. 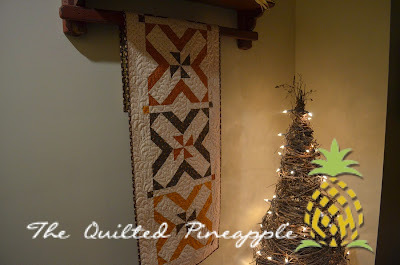 Love all your ideas for displaying quilts...thanks for the chance to win the book. Enough Linda! Once again, I see you have started decorating for Christmas before Thanksgiving gets here. Hope you and your family have a wonderful holiday season and don't spill anything on that table runner which is beautiful, BTW. As always, your feathers are gorgeous. 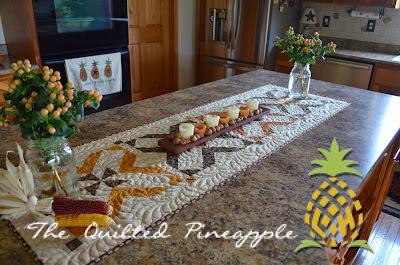 Love your table runner, would have never thought of using it throughout the house like you did. Thanks for the great decorating ideas! Would love to win the book, smile. love LOVE it!!! you have inspired me to make one -- now if i just had the time!!!! maybe i'll just live vicariously through you!!!!! The Quilted Living book looks fabulous...as does your home. You never cease to amaze me. We just moved into our new home, and I am in the process of unpacking my sewing studio. I am so looking forward to being all unpacked and ready to sew, sew, sew!!! I love your table runner! I can't wait to see this book! I love your home! The table runner is gorgeous. Thanks for the fun! Beautiful runner! I love all your different display choices! I was looking at that design thinking I should try it! It's a cool one for a runner! Love it! Your runner is fabulous! And your home! wow! Love how you decorate! I am late coming to see you but I have been away in VA for a sew-in and just returned home tonight. Today is my day so I hope you will come take a peek at what I created. Your quilting is amazing. I have followed you for several years. Love all your quilts ! Your quilting is fabulous! thank you! Great colors and wonderful quilting!!! Thank you for the chance to win this great book. Ooooooooo! A book giveaway!!!!! Thanks! This book looks like it would be a great addition to my library. Love the design and the versatility it gives quilters! Love how you made it "fit" into your home in a variety of decorative ways. And it's always a bonus to see pictures of your home!!! Love the runner, and this book would be so fun to play with. Beautiful runner adaptation from the quilt! Your choice of Autumn colors are lovely too, warm and inviting. This book should be very popular = congrats to the designer Gerri. I find it amazing how quilting can take something that looks ordinary and make it spectacular. Love your runner! What a great pattern. You did a great job of showing it off! Would love to try it for myself! Love your quilting! Today is my first visit to your site/blog. Thanks for the chance to win this great looking book! Your table runner is lovely, as is your home. Would love to win this book. I love your table runner. The book looks amazing! I would love to win a copy. The book has been on my Christmas wish list, but if I got lucky and won I wouldn't have to wait for Santa! Oh, your runner is fabulous!!! The pattern is great but your quilting takes it right over the top!!! This book needs to go on my wish list!! I have adored this book and just haven't given into buying it, at least, YET! Thanks for the opportunity to win one. I love your tablerunner. It looks great anywhere in your home. When I saw a single block, I thought one block would make a great "framed" wall hanging. It looks like a very versatile block. Thanks for putting your "spin" on it. I've been drooling over this book ever since it came out! I LOVE your runner, esp hanging on the wall as you go into your studio. Thanks for showing us your work!